My dear, dear husband has many talents and he is very intelligent. He knows all kinds of obscure facts particularly about history. However, a walking calendar he is not. Every year, he asks me when Halloween is. Seriously. Every. Year. Today was that day which reminded me that I haven't shared my one and only Halloween card for this year. 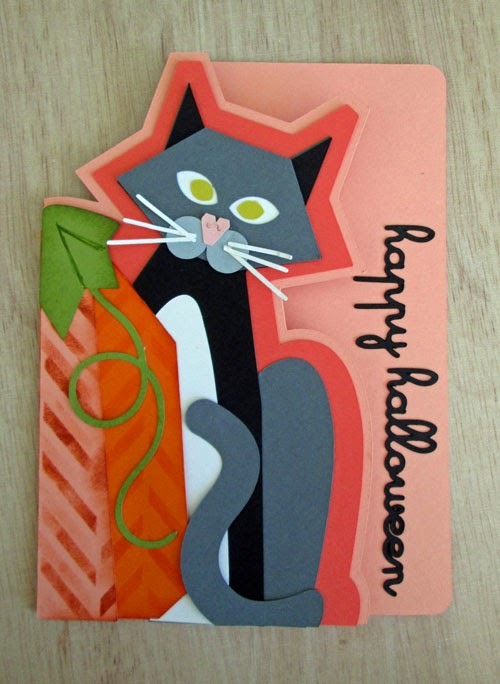 This kitty card is from the Silhouette store. I have to say that I'm glad it is my only card. It was a bit of a bear to cut all these pieces in different colors. I did a little bit of stenciling on the pumpkin pieces with Hero Arts Tweed stencil. He is cute though and it is on its way to Dillon. Hope you are having a great week! Too funny about an otherwise perfectly intelligent man! Hee-hee. LOVE your kitty card. I'm sure Dillon will enjoy it. Happy Halloween!